La Plage is a newly renovated 1970's character home featuring four double bedrooms and two bathrooms with all of the luxuries you would like to expect for a hassle free holiday. La Plage accommodates up to 6 people comfortably, so families & friends can enjoy their stay with plenty of room for everyone. La Plage is located only metres from Quinn’s most beautiful and friendliest beach, as well as close to shopping centres, cafes and restaurants. La Plage opens out to a beautiful private and leafy garden with outdoor entertaining and a partially covered BBQ area. The front veranda of La Plage is also private. All furnishings are beautifully appointed to match the unique style of Old Quinns. The renovated vintage styled kitchen is well equipped with a dishwasher, side by side fridge with ice maker and other handy kitchen appliances. The lounge room features a Plasma TV and DVD player, surrounded by a funky leather lounge suite. A centrally located wood fire creates atmosphere and warmth. The outside area is very private, with an outdoor dining set, barbeque and large rectangle solar heated above ground salt water pool. All appliances & linen are supplied combined with all the modern conveniences. 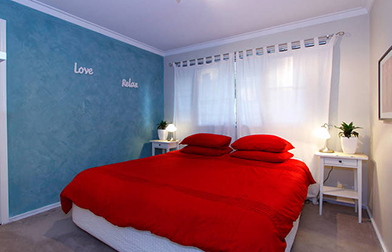 Come & enjoy a relaxing unforgettable stay at La Plage in popular Old Quinns. This coastal holiday home features a solar heated pool and is within walking distance to the Indian Ocean.